Forget for a moment the mind-numbing arguments that blanket discussions about health care these days. Let’s get back to the real reason this industry is so fascinating: the ever-evolving advances in medicine that save lives, restore health or just make our days on this earth a little more comfortable. In Columbia, these “Eureka!” moments are coming at a fast clip from clinicians and researchers alike. Little wonder mid-Missouri is often called the medical mecca of the Midwest. The way to a man’s heart may not be through his stomach — nor to a woman’s either, it turns out. Todd Vogel prefers to use 3-D imaging and a catheter to open up those pathways blocked by a patient’s peripheral artery disease. The chief of vascular surgery at University of Missouri Health Care is the first surgeon in Missouri — and one of the first in the United States — to use new image-guided technology to treat the condition marked by narrowing of the arteries that carry blood to limbs. Peripheral artery disease is a common circulatory problem in which plaque builds up inside the arteries of extremities — usually the legs and feet — and blocks blood flow. Common risk factors include aging, smoking, diabetes, high blood pressure, high cholesterol, obesity and inactivity. If left untreated, painful symptoms that hinder daily activities can progress to an inability to walk even short distances. Eventually, gangrene sets in, leaving amputation as the only option. The new system Vogel uses allows physicians to see inside an artery and simultaneously remove plaque buildup. “It’s the first time we’ve been able to visualize an artery from the inside to precisely guide the catheter and remove a blockage at the same time,” Vogel says. The minimally invasive procedure does away with traditional reliance on X-ray imaging combined with touch and feel to locate the blockage and stents to keep the artery open. Imaging technology known as optical coherence tomography powers the system to capture real-time 3-D images physicians can view as they maneuver a catheter to the precise site of a blockage, where they can remove it to restore blood flow. Other advantages include decreased operative risks, shorter procedural and recovery times, and no need for general anesthesia, Vogel says. He adds that the process minimizes or eliminates radiation exposure as well, because X-ray imaging is unnecessary. Personal trainers, personal diets … personal eye drops? In the anonymous age of mass marketing, an individualized approach to a medical need can make all the difference to patients. For those who suffer from dry eyes, trial and error is the usual means to seek comfort, with many patients visiting up to five doctors before they find relief. Ophthalmologists at University of Missouri Health Care’s Mason Eye Institute have devised autologous serum eye drops, made from properties found in a patient’s own blood, that offer long-lasting relief without the irritation found in commercial eye drops. According to Mason Eye Institute Director Frederick Fraunfelder, the personalized eye drops start with a blood draw at an MU Health Care lab. The blood goes to Saving Sight, a local eye bank, where technicians extract the viscous serum from the patient’s blood and mix it with a saline solution. 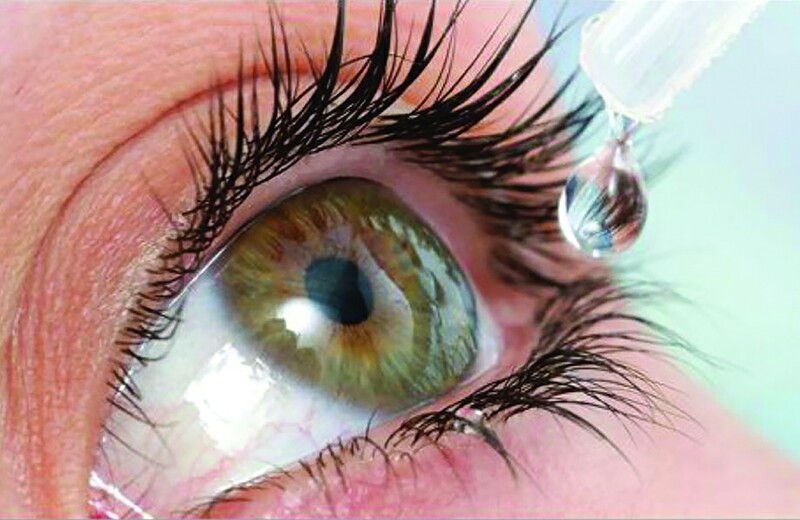 Less than a week after the blood draw, patients have uniquely fashioned eye drops, suited to their personal body chemistry. Each batch of autologous serum eye drops lasts about two or three months, depending on the severity of eye dryness. The drops are preservative-free, and must be stored frozen; thawed drops last a week under refrigeration. Dry eyes are a natural occurrence with aging, although patients with diabetes, rheumatoid arthritis or Sjögren’s syndrome are more prone to severe dryness, as are people who take antihistamines or blood pressure medicine. The dryness is uncomfortable, and if left untreated, can result in ulcers; infected ulcers could cause vision loss. The drops work because blood contains several proteins and lubricants that benefit the eye. Because the drops derive from patient’s own blood serum, those proteins and lubricants don’t irritate but soothe — and can even help heal the eyes over time. Saving Sight is a nonprofit organization that introduced eye donation to Missouri. Founded in Columbia in 1960, the group operates several vision health programs and works with physicians across the state to provide autologous serum eye drops to patients. The “Mamm Van” is on the prowl. Ellis Fischel Cancer Center debuted its new mobile mammography van in April. The 38-foot-long, fully inclusive clinic provides women in rural areas access to the same mammography screening services available at Ellis Fischel in Columbia. 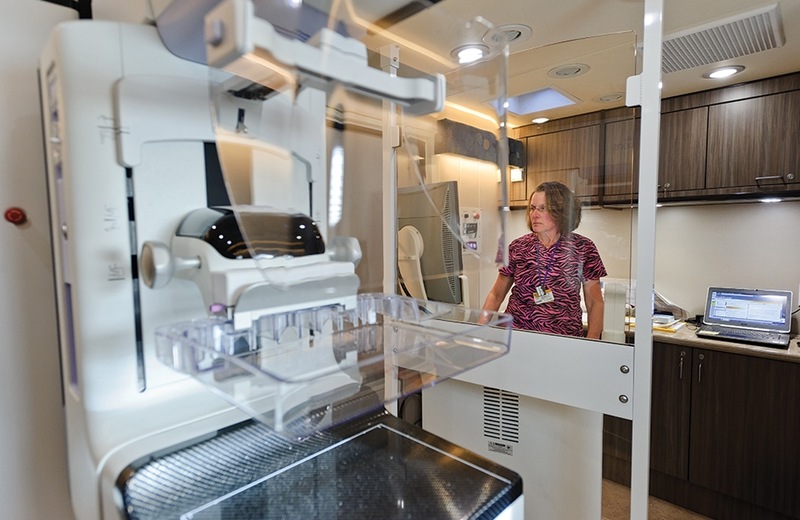 Dubbed the “Mamm Van,” the mobile clinic’s equipment includes 3-D breast screening technology, or tomosynthesis, and a private mammography suite and changing room. The all-female clinical staff provides mammograms, clinical breast exams and breast health education to women throughout the state. Appointments generally take 30 minutes from check-in to completion, and if follow-up care is needed, the Mamm Van team makes the appropriate arrangements. Full support of the Mamm Van is through a pledge of $765,958 from the David B. Lichtenstein Foundation, a private foundation that contributes to charitable organizations in Missouri. Machine vs. machine: Sometimes advances in modern medicine can get crosswise with each other when the innovations are not compatible. Such was the problem for patients implanted with cardiac resynchronization therapy defibrillators who need diagnostic work via magnetic resonance imaging. Although as many as 40 percent of defibrillator patients will need an MRI within four years of receiving the device, most could not undergo MRI scans because of the risk from potential interaction between the MRI and the device. That all changed last spring, when Missouri Heart Center cardiologist Dan Pierce implanted an MRI-conditional CRT defibrillator in a patient at Boone Hospital Center. Pierce is the first physician in mid-Missouri to offer the treatment. 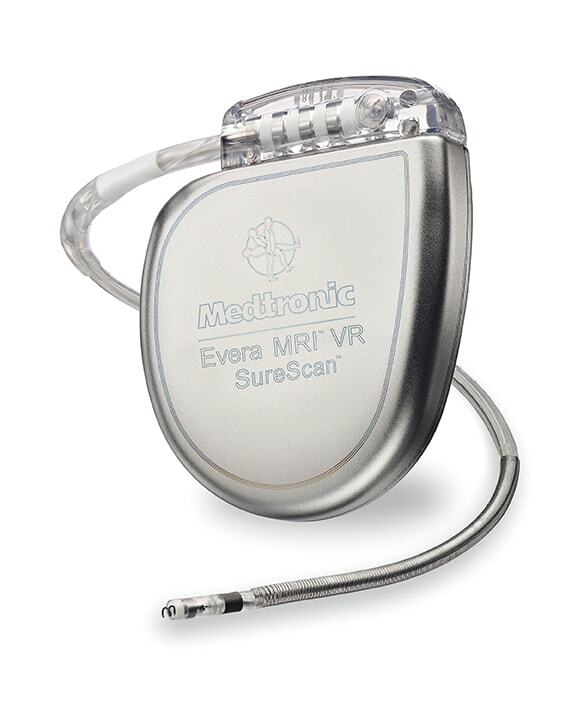 The new devices free heart patients to access MRI scans, which are used to diagnose conditions such as stroke, cancer, and muscle, bone and joint pain. “With these new devices, patients with defibrillators are able to get the testing they need,” Pierce says. Hailed as a significant development for heart failure patients with CRT-D therapy, MRI conditional defibrillators were approved by the U.S. Food and Drug Administration just last February, making Boone Hospital Center one of the first in the country to provide them. A recent study might make you wonder if University of Missouri orthopaedic research has gone to the dogs. 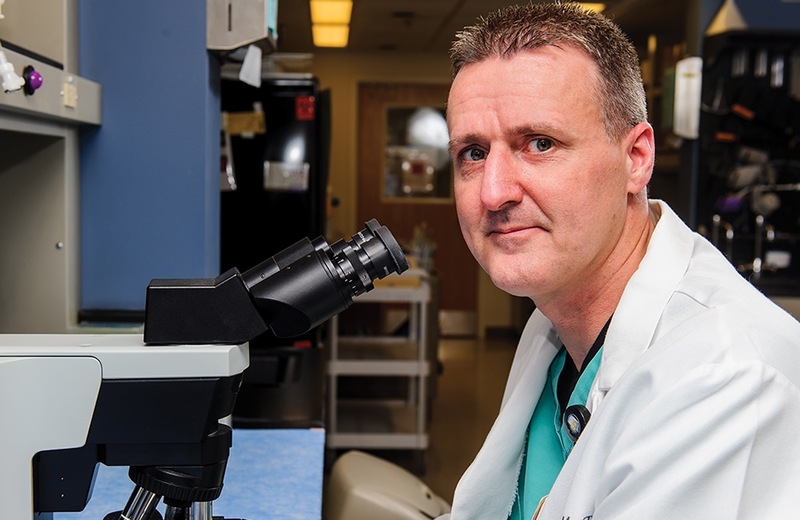 Veterinarian James Cook, director of the division of research at MU Health Care’s Missouri Orthopaedic Institute, has validated a technique that promises a better knee repair. Working with a canine research model, Cook and his team tested a suspensory fixation repair for torn anterior cruciate ligaments, the most common knee injury. Instead of a traditional ACL repair — where surgeons create a tunnel in the upper and lower bones of the knee joint and secure a ligament graft to the bones with screws — the suspensory system uses sutures to pull the graft into sockets created in the two bones; a button on the surface of the bones holds the graft in place. Cook likens the graft-to-bone attachment of traditional ACL repair to a spot weld rather than a fully integrated repair. The press-fit mechanism of the screws can cause cell and tissue damage in the new graft, he adds, resulting in a knee repair that’s prone to failure. The researchers found that only four of the six dogs treated with the traditional screw fixation method achieved full functional healing, and none of the grafts fully integrated into the bones like a native ligament. Of the dogs treated with the newer suspensory system, all six achieved functional and natural healing. Researchers are going nuclear in the fight against cancer. University of Missouri researcher Silvia Jurisson and her interdisciplinary team recently received a U.S. patent for a new delivery method that uses nuclear isotopes to help target, diagnose and treat cancer. The patented method could prove invaluable in battling prostate, pancreatic, breast and small-cell cancers in the body. Jurisson, a professor of chemistry and radiology and a research investigator with MU Research Reactor, works with radiotracers, which are isotopes in extremely low concentrations that can be used to image and treat cancer. “They provide the delivery vehicles necessary to get treatments into the nooks and crannies of the body where cancer cells usually hide,” she says. The research team worked with Arsenic 72, an imaging and diagnostic isotope, and Arsenic 77, a radiotherapeutic isotope. They attached one of the arsenic isotopes to trithiol, a stable radioisotope. 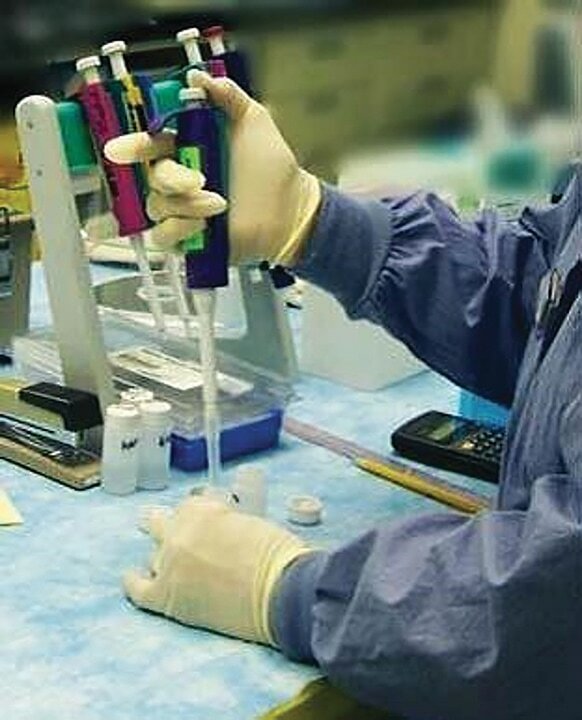 The trithiol package then can be combined with medicine or diagnostic molecules; when injected, it “seeks out” and binds with cancer cells, delivering the proper substance to where it is specifically needed. Early-stage results of Jurisson’s research are promising. If additional studies — including in vivo studies in mice — are successful over the next several years, the research will progress to working with physicians at MU.